If you live in the Greater Toronto Area you experienced an early taste of summer yesterday. The good parts: short skirts, popsicles & sunshine. But also the not-so-good: smoggyness, muggyness & sweatyness. Oh the sweatyness. 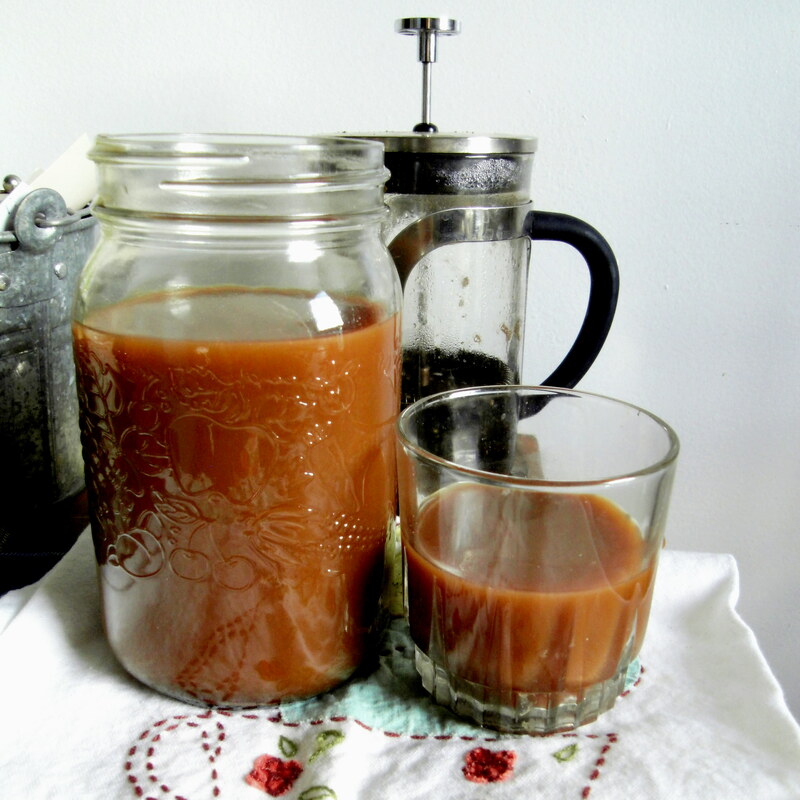 So naturally today I’m sharing one of my favourite iced coffee creations with you. This is a somewhat unique preparation that I stumbled upon one day when I was almost out of coffee and almost out of tea…you see where I’m going with this. In the end I loved how it turned out and have made it time and time again to keep cool while satisfying my fiendish caffeine addiction all summer long. I used a 6-cup french press & a 1 quart mason jar for this recipe. Add coursely ground coffee, cinnamon & the contents of 1 ginger teabag to the bottom of your french press and stir to combine. Add water as usual and brew for at least 5 minutes. 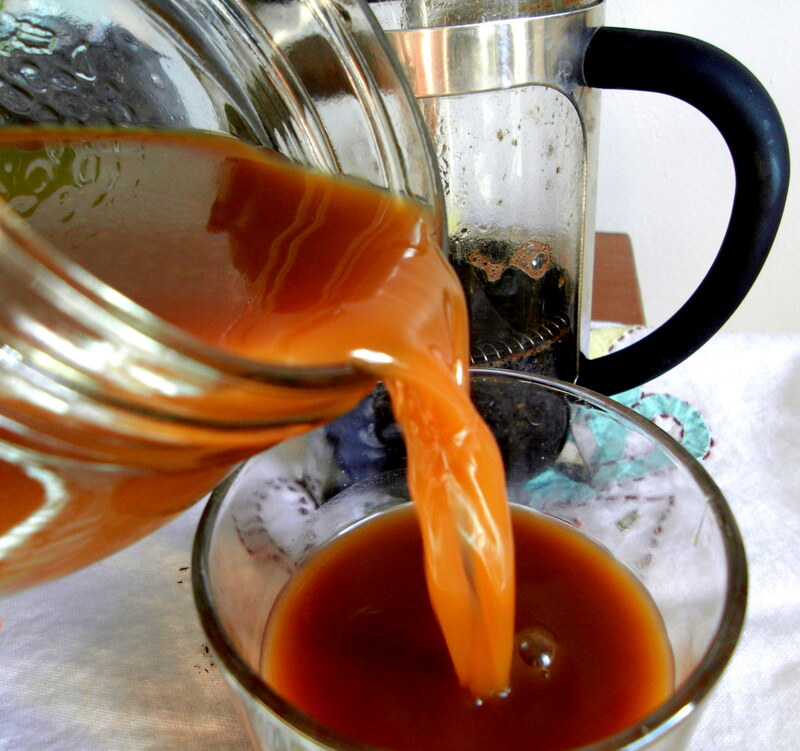 As your coffee is brewing, fill a large mason jar 3/4 of the way with ice. Once coffee is brewed, pour over ice. Add in your sweetener of choice at this point. If you are using granulated sugar, pour hot coffee directly over individual spoonfuls rather than mixing it all in at once. This will help the sugar to dissolve. Top off coffee and ice mixture (which will have mostly melted at this point) with your preferred milk. Pop in the fridge and enjoy with a little extra ice whenever your coffee urge hits. **I’m sure you could use lots of flavours to infuse your coffee – chai, vanilla rooibus or fruit teas like cherry, pomegranate or blueberry all sound tasty to me. I would avoid anything with notes of citrus. That looks wonderful! I’m always so lazy about iced coffee too, just throw some ice cubes in the leftover. I need to get more creative. that sounds so delicious. I don’t have a french press though, maybe I can just stick a teabag into the coffee pot while it’s brewing and let it sit for a bit? hmmm…. I thought I may get a question along these lines! You can DEFINITELY still make this. Just mix the contents of the teabag + a little cinnamon into your coffee grinds before you place them in your filter for brewing. The spice may not be as strong since the tea will have less time to steep, but it will definitely still leave the coffee with a lovely aroma and flavour. Let me know how it goes! YES this is an excellent idea. As an equal opportunity coffee + tea lover, I must make this creation! So true. I just ate my morning oats out of a jar this morning…Practical (I have no clean bowls) & Cute as heck! Best combo!